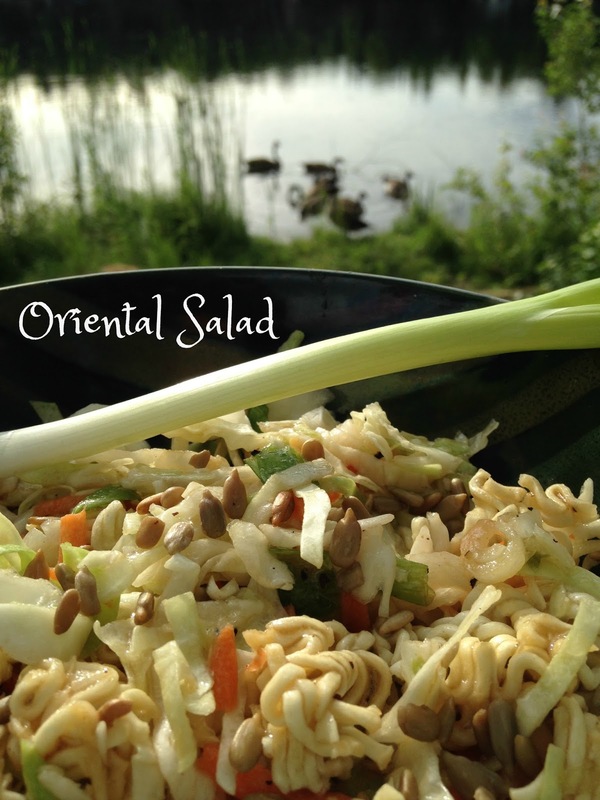 Oriental Coleslaw (Ramen Noodle) Salad has been around forever. There are many different variations of this salad, some use chicken flavored ramen noodles, others don’t. We prefer to use the oriental flavored ramen noodles, if you can find them.noodles. I’m not sure why but in my area, Northern WI, oriental flavored ramen noodles aren’t always easy to find so when I do find them I stock up. We like to use almonds in this salad but cashews make a great substitute. Coleslaw from the Dutch koolsla, meaning “cabbage salad” kool (“cabbage”) plus sla (“salad”). 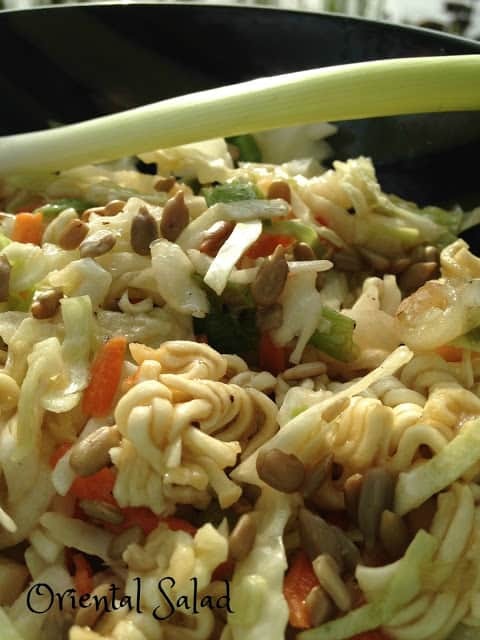 Coleslaw is a salad of shredded red or white/green cabbage mixed with a mayonnaise, vinaigrette, or other type of dressing. Other ingredients such as chopped onion, celery, sweet green or red pepper, pickles, bacon or herbs may be added. 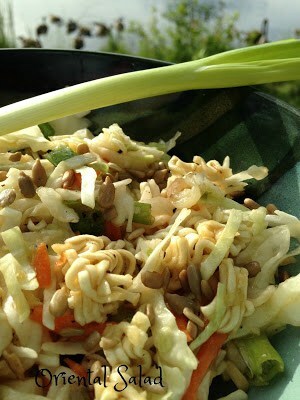 There probably as many variations of coleslaw as there are cooks. 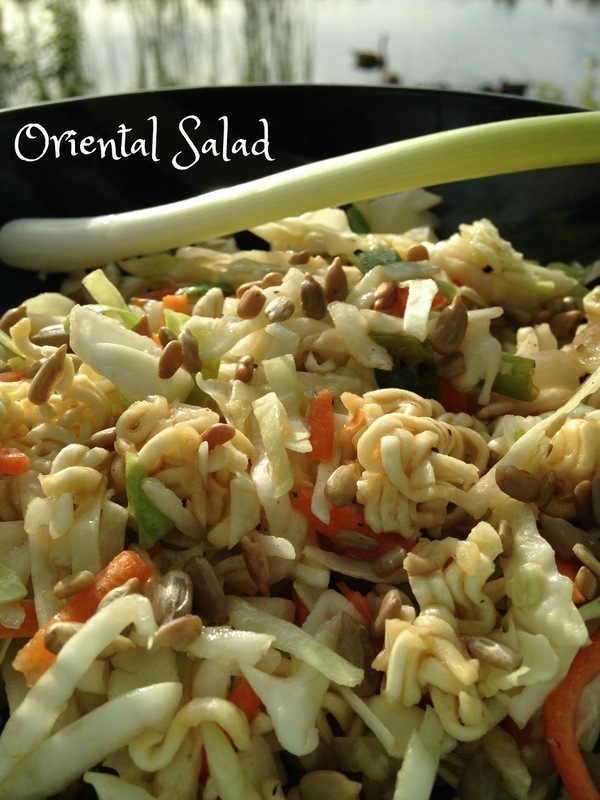 Oriental Salad is not only delicious and easy to prepare, it’s one of the most economical summer-time salads you can make. This salad can easily be thrown together for under $5.00 and can serve between 4 to 6 people. Not too shabby. Add slices of grilled chicken for a great light lunch option. 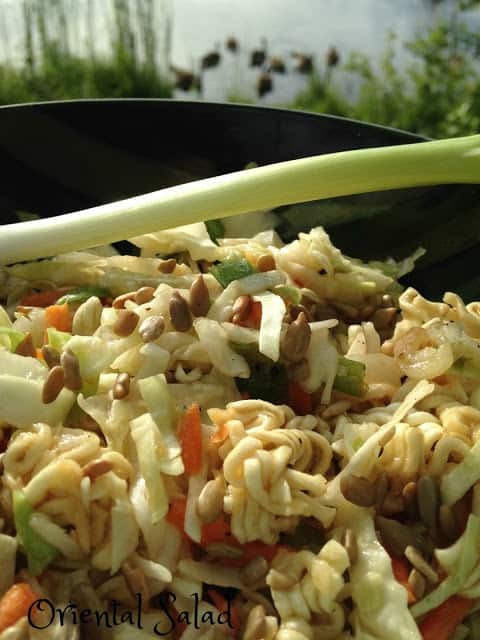 Combine coleslaw mix, green onions, ramen noodles (set aside seasoning packet for the dressing), almonds, and sunflower nuts in a salad bowl. Chill covered, until serving time, up to 1 hour. 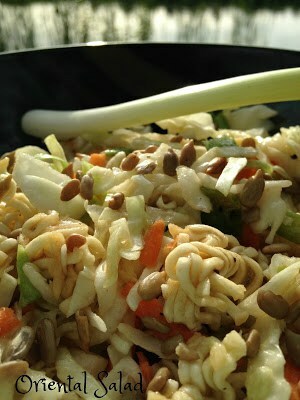 For dressing: In a screw-top jar, combine oil, vinegar, sugar, salt, pepper and seasoning from the package of noodles. Cover and shake. Chill until serving time. Before serving, shake dressing; pour over salad and toss to coat. If you like, garnish salad with additional sliced green onion.